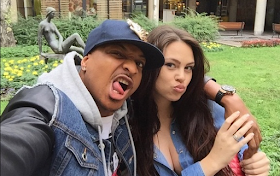 The actor, IK Ogbonna, has often drawn harsh words from Nigerians about the way his wife, Sonia, dresses. Some people in social networks have accused Sonia of flaunting her body, despite her status as a married woman. However, in a conversation with Sunday Scoop, Ogbonna stayed by his wife's side, as he maintained that he has no problem with the way he chooses to dress. He said: "I feel that some Africans do not even know their own story, Africans used to run naked until the white man came with religion and they told us we had to cover ourselves." If you check traditional African clothes, our mothers usually tied a cloth around her chest and another cloth around her waist, then decorated her waist with beads. "There is a culture in Namibia where women move without blouses and their breasts are exposed, even the Maasai tribe in Tanzania and Kenya do something similar: Africans believe in the arts and used to have drawings on their bodies before the proliferation of the so-called They drew marks on their bodies to differentiate families and tribes. "Like us Africans, we have embraced religion and we have become too religious, I feel we have forgotten our culture, I am not saying that nobody should dress provocatively, but do not forget where you come from. "My wife does not dress in a provocative way She is half American and half European In her country, that's the way people dress, I try not to tell her what to do or what not to do Before she marries me, she She was living her life and made the right decisions that took her to the point where I admired her, I see no reason to change her style now that we are married, I loved her the way I knew her and I have no problem with that. She takes a bikini to the church, then I would complain, but if she takes it to the beach, I would not move my eyelids because that's the right clothes for that particular place I see some girls with jeans on the beach and putting on makeup I think it's nonsense. "